An unexploded device found on a beach has been detonated in a controlled explosion by Royal Navy divers. 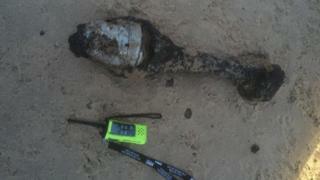 The object was found at Winterton-on-Sea near Great Yarmouth on Tuesday. HM Coastguard at Humber called in the Joint Services Explosive Ordnance Disposal Unit, a spokesman told the BBC. A diving team looked at the device, probably from World War Two, and it was destroyed by a controlled explosion at 09:00 GMT on Thursday. How much of a threat are unexploded bombs?